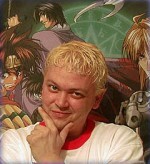 Greg Ayres is not your average voice actor. The once “Fanboy” turned VA started working for ADV Films just a few years ago, and in that short time managed to snag two of his favorite roles in anime. He was thrilled to voice the role of his favorite character Son Goku in Saiyuki, then just one year later Kaworu Nagisa in the Director’s Cut of Neon Genesis Evangelion. Other roles include Chrono in Chrono Crusade, Negi Springfield in Negima, Heihachi in Samurai 7, Satoshi Hiwatari in DNAngel, Pope Alessandro XVIII in Trinity Blood, Tsuyoshi in Kodocha, Leo in Ghost Stories, Tsujido in Speed Grapher, and Gau Ban in Shadow Skill.He can also be heard in other anime titles such as Super Gals, Spiral, Macross, Mythical Detective Loki, Burst Angel, Gravion, Godanner, Pretear, Full Metal Panic, E’s Otherwiseand a whole lot more.When he’s not in a booth with headphones on, you can usually find him sporting headphones of another variety behind “the decks”. A veteran nightclub DJ of many years, Greg has really enjoyed the opportunity of doing something else that he truly loves. From packed rooms at anime conventions, to the legendary stage of The Knitting Factory (NYC), Greg never misses an opportunity to share his love of music with anyone who will listen.